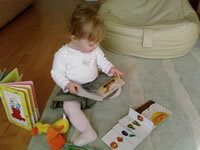 Bookstart is a scheme which encourages parents to share books with babies and young children. Tameside Bookstart Project began in 1996 and is recognised nationally as a flagship scheme. Bookstart nationally receives support from the Government and there are now 2 free Bookstart packs for children aged 0 to 4. This is given to parents at their child's 8 to 12 months development check. This is given to parents of children in the school year in which they reach their 4th birthday. Boxes are handed out by Bookstart staff at Nursery schools when parents are invited to attend a talk about books. Don't worry if your child attends a private nursery because packs will also be given out there. It is never too early to start looking at books with your child. It can be difficult at first, babies do not concentrate for very long. Try using books in lots of different ways, make it a fun activity and you won't go wrong. Yes, not only does it help to create a close bond between parent and child, it also helps to develop a child's language and concentration skills. Remember books build brighter babies! Books can be read anywhere. On the bus, in the car, on a train, on your knee, doctor's surgery in fact anywhere you choose. Once your child takes an interest in books they will find it an enjoyable and worthwhile activity. Start by using the book as a toy. Hide the characters and play peekaboo. Make the story up as you go along. Involve your child as much as possible. Name each picture, find certain things, have fun learning together. Talk about the book. Let your child turn the pages to discover new pages, or encourage your child to lift flaps and make noises. Nursery rhymes and songs are just as important. They also help with your child's language and concentration skills. Bedtime is a great time to share a book. Its a good way to snuggle up and calm down before going to sleep. Bookstart Time for a Rhyme sessions for babies and the under 4's are held regularly at all Tameside libraries. Half hour sessions with puppets and musical instruments. Learn some new rhymes and help your child's speech development. For more information Send Bookstart a message or telephone 0161 343 7824 who will be happy to answer any questions. Alternatively, look at the events calendar which details the talks and activities. Remember! Use your Library, books are free, and babies can join from birth. The Bookstart Bear Club is the fun and free membership reward scheme for all babies, toddlers and preschoolers aged 0 – 4. From Monday 9 January 2012, the Bookstart Bear Club will be available in all Tameside Libraries. The Bookstart Bear Club is a fun and engaging free reward scheme for all babies, toddlers and preschoolers and their families. It will open up an exciting world as families and children explore stories, books and rhymes together as members of their library. It is part of a national scheme run by Bookstart that aims to reward children coming to the library and joining in rhymetimes, borrowing books and exploring and sharing stories with their families.